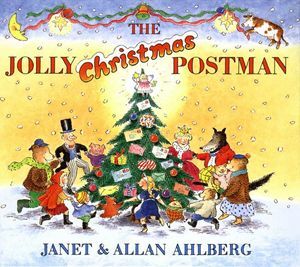 Classic team Janet and Allen Ahlberg give children the greatest Christmas gift... a classic book of their beautiful work in this divinely traditional story about The Jolly Postman at the most festive time of the year. This is just the most adorable Christmassy stocking-stuffer book. It not only contains the stunningly detailed illustrations Janet is famous for, but a bunch of treasures secreted away in full-page pockets - making it a real Christmas treat. There's the Humpty Dumpty jigsaw puzzle, the Christmas card to Baby Bear from Goldilocks, the fold-out board game to Little Miss Riding Hood from a certain Mr Wolf, the Toytown Christmas Annual booklet - just to name a few. Kids will love exploring the pockets for treasure and also following the Jolly Postman as he makes his festive mail deliveries to a gaggle of storybook characters. Unexpectedly funny (like when Mr Wolf takes pains to note to Riding Hood that he is now a changed wolf), this will fast become a storybook favourite in any Christmas-loving house. What on earth would we do without the Jolly Postman to deliver our Christmas mail? Agreed. We love the Jolly Postman and the Christmas version is one of our favourites.